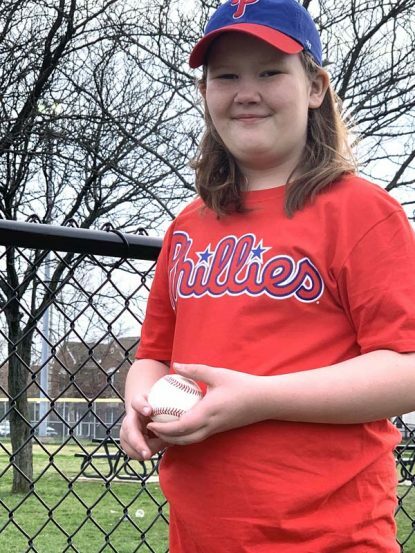 Keira Quinn, who attends the Out-of-School-Time program at St. Gabriel Parish in Philadelphia, will throw out at the first pitch at the June 21 Catholic Charities Night at the Phillies — if 500 tickets are sold through a CCA initiative. The Archdiocese of Philadelphia’s Catholic Charities Appeal (CCA) will once again partner with the Philadelphia Phillies to host a night of family fun at Citizens Bank Park on Friday, June 21 at 7:05 p.m. as the Phillies take on their Eastern Division rivals the Miami Marlins. If 500 of those tickets to the game are sold, Keira Quinn, a student from the Catholic Social Services Out-of-School Time Program at St. Gabriel’s in Philadelphia, will throw out the first pitch of the game. In addition, a CCA beneficiary organization will sing the National Anthem. June 21 is also Chase Utley Retirement Night, featuring a special pregame ceremony in which the Phillies star will officially retire as a Phillie, capping his 16-season big-league career. All fans will receive a Chase Utley bobblehead figurine. The appeal is the archdiocese’s most important fundraiser each year, benefiting hundreds of thousands of people through scores of organizations and ministries in the Philadelphia region. Programs that receive funding from CCA include housing for the homeless, community food cupboards, afterschool academic enrichment and recreational opportunities for youth, and family support services. To purchases tickets for the game in support of the Catholic Charities Appeal, visit this link. Seating will be located in the Outfield (sections 101-107) at $43 per ticket, Pavilion (sections 201-205) at $34 per ticket and Pavilion Deck (sections 301-305) at $23 per ticket. To learn more about the 2019 Catholic Charities Appeal, visit the website.